As the Academy gets set to hit the road for its 2016 summer tour, the corps will host a special send-off event on Saturday, June 11, which will include a nine-minute preview of the corps' production. Blue Knights had Sam Pilafian, music professor and co-author of “The Breathing Gym,” stop by a recent rehearsal. 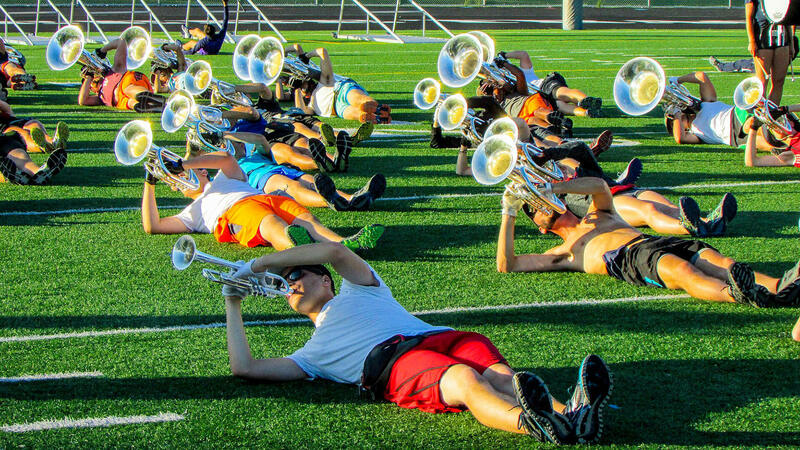 More than 100 new spring training photos were posted by the Blue Stars on Facebook. Carolina Crown had a record turnout for its CrownGOLF tournament and fundraiser on Monday June 6. The Cavaliers organization raised more than $21,000 at its recent "Ensuring Our Future" fundraiser. Colts and Colt Cadets members will host their annual car wash on Saturday, June 11 in Dubuque, Iowa. Gold is looking for several drummers to join its drum corps and DrumLine Battle team. Guardians has partnered with Navarro College in Corsicana, Texas for its spring training rehersals. Impulse released a video highlighting its 2016 series of educational percussion clinics. Several spots are still available if you'd like to join Incognito for the corps' 2016 summer season. Music City has an immediate opening in its bass drum section and several openings in its brass section. Former DCI judge and well-known music educator, Dr. Andy Poor, attended recent Pacific Crest rehearsals to work with the corps' brass section. Phantom Regiment is hosting a 60th anniversary party on Friday, July 8 for alumni, family and friends of the corps. A limited number of tickets remain. Raiders is looking for two CDL drivers to work with the corps during its 2016 summer season. One last Shadow brass spot is available for the corps' innaugural season as an Open Class corps. Southwind posted a video featuring spring training highlights. The Spartans organization announced the newest alumna member of its board of directors. Spirit of Atlanta announced its very first Hall of Fame inductee, corps founder Freddy Martin, who will be inducted on June 25. Thunder is in need of a semi-truck driver with CDL to join the corps for its 2016 summer tour.